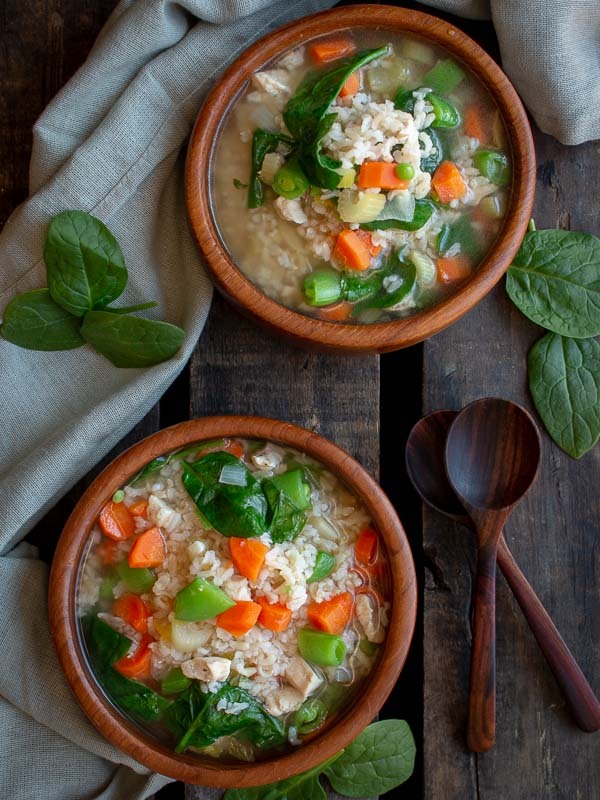 A few slurps of this delicious Immune Boosting Chicken and Rice Soup and your nasal passages will start to open up from the steam. You will start to warm up from the inside out with warming ginger and garlic herbs. All the veggies and proteins are cut up small and the same size it is easy to digest. This savory nourishing bowl of soup is just what your body and soul are craving. Are you sick with the cold or flu this season? We never ever get sick. However, this year the respiratory flu has invaded our whole family. Colds and flu are no fun so we are sending some positive thoughts your way for a quick recovery. We want to arm you with some helpful hints to help you get you through it. The males in the group have the flu. They have completely shut down. The world has come to a complete gridlock stop. They are even unable to fetch their own glass of water. The females in the group have the exact same flu with a fever of a 102F, cough, chills, body aches but still manage to make dinner for the family, throw in a couple of loads of laundry whilst taking caring of the sick bedridden males in the group. How is this even possible? LOL We are certain this is not indicative of every family or is it? Anyone want to share their experience regarding this situation? We are all ears! The cold and flu season has peaked around the world. This year the flu has been especially virulent causing many hospitalizations around the world, especially in the elderly and in the young. So prevention is the key. How do you Know if you have the cold vs the flu? Both the cold and flu have some overlapping symptoms so it can be really difficult to distinguish the two from each other. The only positive way to know one way or the other is to have a swab done within the first couple of days of symptoms to see if you are carrying the influenza virus and its antigens. Both the cold and the flu may have all the usual things like coughing, aches, sometimes sneezing, stuffy nose, etc. Colds generally do not result in long term health complications. However, the flu has a higher percentage of complications such as pneumonia, bacterial infections and hospitalizations. Colds usually come on gradually and maybe start with a sore throat and then stuffy nose and coughing but are relatively mild. On the other hand, the flu within just a few hours makes feel like you have hit a Mack Truck and the truck won. Fevers, chills, severe body aches, maybe rigors and headache along with some of the cold symptoms. Your ibuprofen or acetaminophen may be just sitting on the other side of the room but you feel to weak to get up to take some. This is the nasty flu. 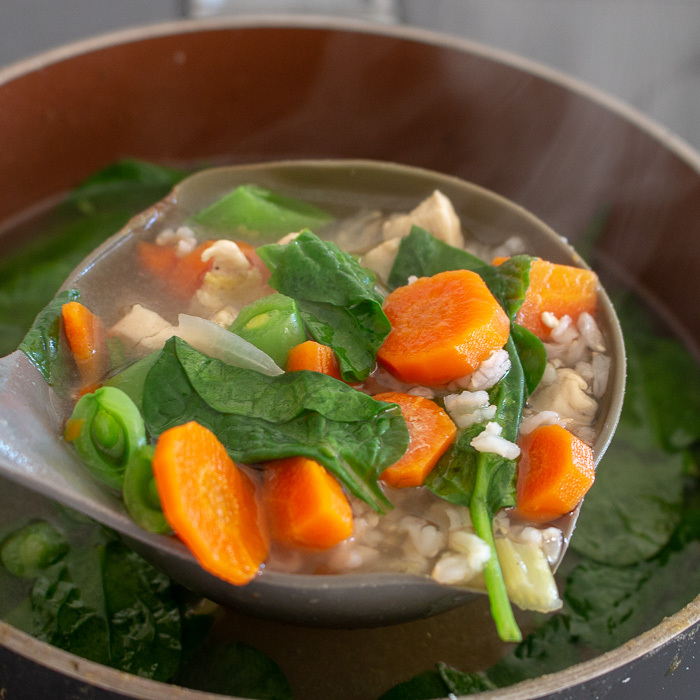 One way prevent the cold and flu is to make a big batch of our Immune Boosting Chicken and Rice Soup BEFORE you get sick. Yep! You heard us right. Of course we enjoy a delicious bowl of soup when we are feeling under the weather, but the best time to enjoy this soup is actually enjoy is actually before getting sick. We like to make a double batch and enjoy through out this season as it freezes well too. Traditional stove top directions, slow cooker and instant pot directions are included to make it as easy for you as possible. 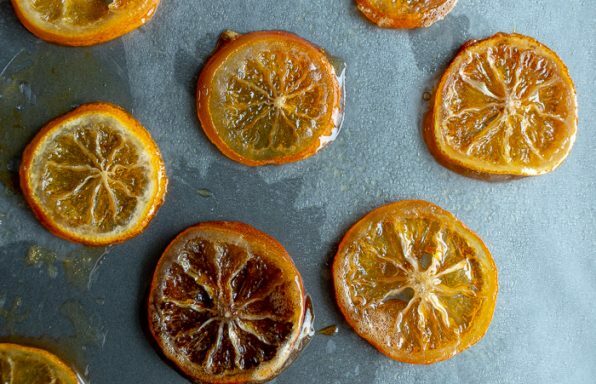 We originally posted this recipe in August of 2011 and wanted to share with you the updates. Western Medicine vs Traditional Chinese Medicine (TCM) causes of Cold and Flu. In Western Medicine, we believe the cold and flu is usually due to a virus and usually is treated with over the counter measures to just relieve the symptoms or sometimes even Tamiflu to reduce the duration. In Traditional Chinese Medicine (TCM) it is believed that a change in season, along with a weakness or deficiency along with and exogenous force for example wind, heat, fire, cold and damp it can cause illness. The belief is that these cold and flu types of illnesses are a result of an exogenous "wind" factor along with a weakened disposition or an imbalance in your body. In the winter, this may be referred to as COLD Wind whereas you have symptoms of sneezing, chills, post nasal drip, coughing up clear phlegm and achy body. HEAT Wind is different as you may have a fever, sore throat and maybe you are coughing up yellow sputum. Do you know why it is important to understand the differences between COLD Wind and HEAT Wind? You should nourish your body and help it bring it back to balance using foods and beverages that are complimentary to your symptoms. For example, if you are having symptoms of COLD wind (chills, clear phlegm, etc) then having lots of Immune Boosting Chicken and Rice Soup and Tranquil Lemon and Ginger Tea is going to help you bring your body back to balance and help you recover quicker. However, if you are having symptoms of HEAT wind (fever, sore throat, yellow sputum), you should be eating more neutral foods and cooling foods to balance out your fever and signs of heat. 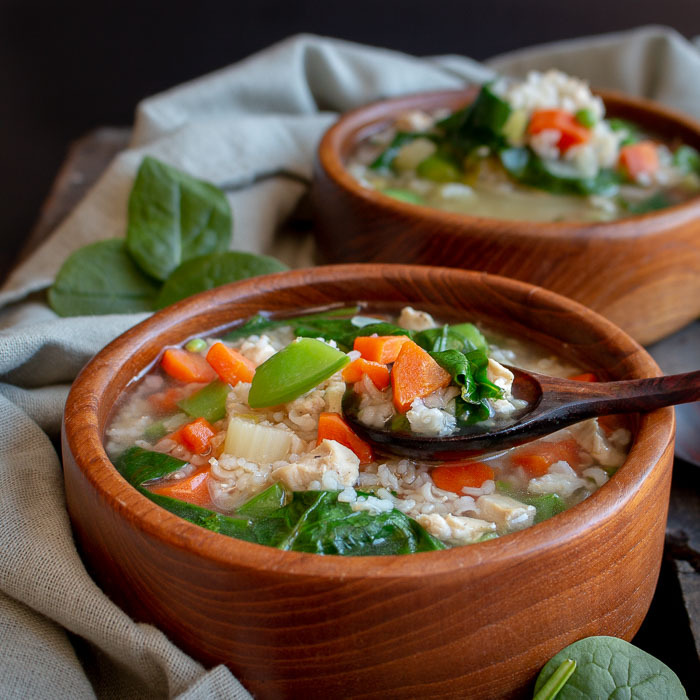 You may choose to modify this Immune Boosting Chicken and Rice soup and reduce the garlic and remove the onions and ginger as these are warming. 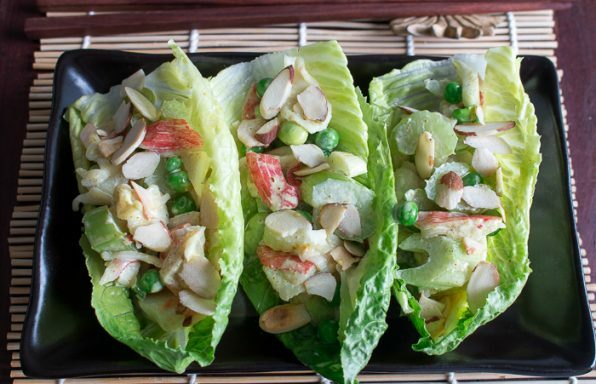 Instead, you may wish to replace with more cooling vegetables like cabbage, broccoli, cauliflower or mung beans. You might want to exchange the chicken with pork, beef or duck instead. You may also wish to drink a cooling peppermint or chamomile tea to bring your body to balance. Introducing the Five energies of food is a great overview of example neutral, cooling and warming foods. Once your body is back to baseline, you want to go back to nourishing your body and strengthening your spleen so you are less apt to get sick next time around. 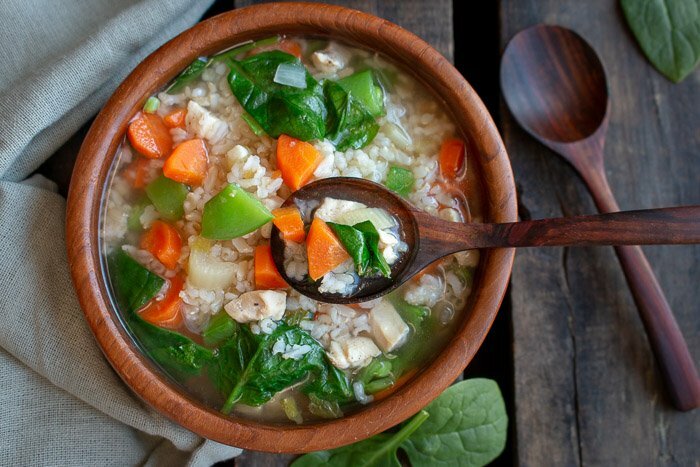 Immune Boosting Chicken and Rice Soup is warming according to Traditional Chinese Medicine (TCM). Warming and nourishing helps promote Spleen Qi especially if due to cold disposition. In Traditional Chinese Medicine (TCM) the spleen is responsible for digestion. Your gut is your power core to health and happiness. When your spleen is running like a well-maintained engine, you feel great. When you have failed to do the basic maintenance, you are going to start to have engine trouble and feel unwell. If your body is in balance, well rested and well nourished, you are less likely to fall ill from exogenous factors. 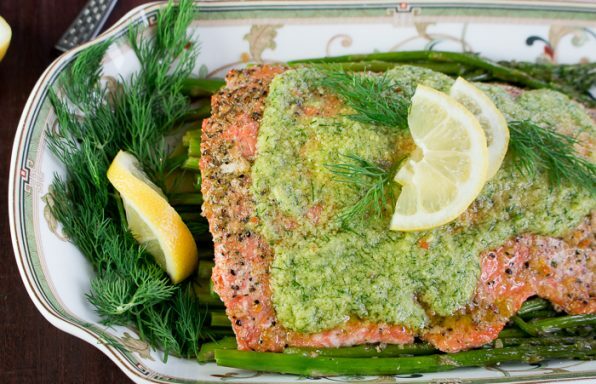 Learn how to Feed Your Spleen: Nourish your body and take that first step in staying healthy. Of course, the usual get adequate sleep at night and keeping stress away are all good measures to stay healthy too. It's important to dress warm during those cold months too. It's hard to keep every nasty bug away from you but washing your hands often and especially before eating is really important. Living in Asia, has made us pretty cognizant on how important it is to prevent germs from spreading. Please stay at home if you are sick. Wear a mask if you are sick in public areas and dispose of your used tissues appropriately. If you need to fly during this cold and flu season, bring a mask along as there is a 50% chance the person next to you is going to be sneezing and coughing all over you the whole flight. Seriously, this drives us crazy. You just want to get up and spray the whole area and the person next to you with a case of Lysol! Our kids share everything from pencils, treats in their lunchbox and of course all of the seasonal colds and viruses. 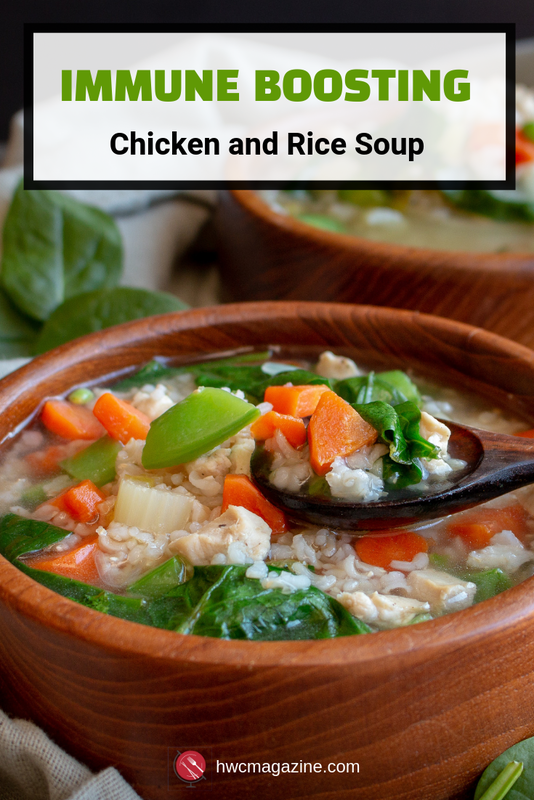 Be prepared this year to keep your family happy and healthy this school year with this Immune Boosting Chicken and Rice Soup in your armory of recipes. 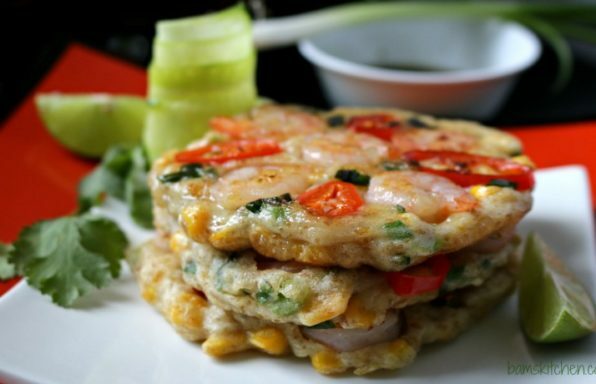 Delicious and nutritious, it is sure to get you back on your feet quickly and help warm your soul. If you ever had a cold as a child, did your mom give you a cup of chicken soup and tell you that it would make you feel better? Mom's are always right, Chicken soup has special qualities to help reduce cold and flu like symptoms. Did you know there have been studies that found that some components of the chicken soup inhibit neutrophil migration or movement, which may have an anti-inflammatory effect that may actually help to temporary ease from symptoms of illness. Garlic has been known to help strengthen the immune system. Ginger is a spice that helps with digestion and makes the body feel warm. Chili Peppers, if you choose to add any, contain Capsicum and this peppery heat stimulates secretions that help clear mucus from your stuffed up nose or congested lungs. So there you have it, your mom was right! Chicken Soup is good for your health. If you are performing self home treatment for the cold/flu and you are having increase shortness of breath, chest pain. increased temperature after being afebrile or any other signs, please get seen by your medical provider asap. Disclaimer: The contents of this website are for informational purposes only and do not constitute medical advice. The Content is not intended to be a substitute for professional medical advice, diagnosis, or treatment. Always seek the advice of a physician or other qualified health provider with any questions you may have regarding a medical condition. Never disregard professional medical advice or delay in seeking it because of something you have read on this website. 1In a large pot or dutch oven place olive oil, onion, garlic, ginger and chili peppers and saute until aromatic. 2Add chicken and salt and pepper and cook for 2- 3 minutes. 4Add Chicken bone broth (or chicken broth) rice and bay leaves. Bring to a boil and then turn down heat to simmer and cook for about 30 minutes. Remove bay leaves and discard. Check for taste. Add more chili flakes, salt and pepper as desired. 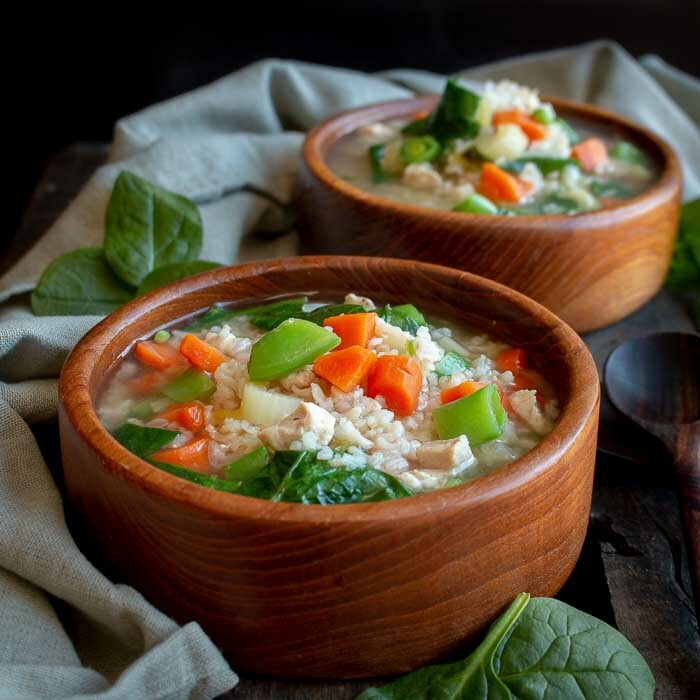 5Serve your Immune Boosting Chicken and Rice soup in a large bowl and start feeling better soon! 6Slow Cooker Option: Place all chopped items together in the pot, except oil and spinach or any leafy green vegetables, and place on low heat for 6- 8 hours or high heat for 4 hours. Add your spinach to the hot soup and serve. If you happen to come home from work with cranky sick kids, dinner is already prepared and the madness can begin. 7Pressure Cooker/Instant Pot Option: Turn your instant pot to saute function. Add oil, onions, garlic, ginger and chili and saute until just aromatic. Then add your chicken and saute for about 5 minutes. Add the rest of the ingredients except the spinach and pressure cook for 6 minutes. Let your instant pot decompress for 10 minutes and then perform the quick release. 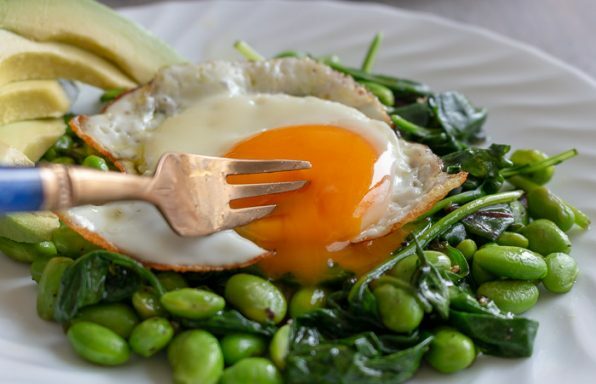 Add your spinach or leafy green vegetables of choice and enjoy. 8Chef suggestions: Feel free to add any vegetables you desire. If you currently have a fever, you may want to omit the chili peppers, reduce the garlic and ginger as you are already heaty internally. Chicken is also warming so if you have a fever exchange with pork or beef instead. We added a little handful of cooling spinach just to bring balance to the recipe. 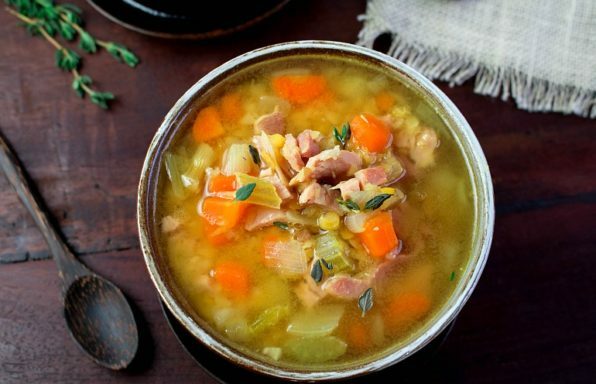 You can store your soup for up to 3 days in the refrigerator or up to 2 months in the freezer. The soup will thicken as it sets due to the rice. You may add a little extra water or chicken broth to thin out when reheating.